Are antelopes some of a few most interesting wildlife species that you would like to see while on a game safari in Uganda and you do not know where to go? When it comes to African safaris, Uganda is undeniably one of the beautiful countries which are endowed with a number of wildlife species. 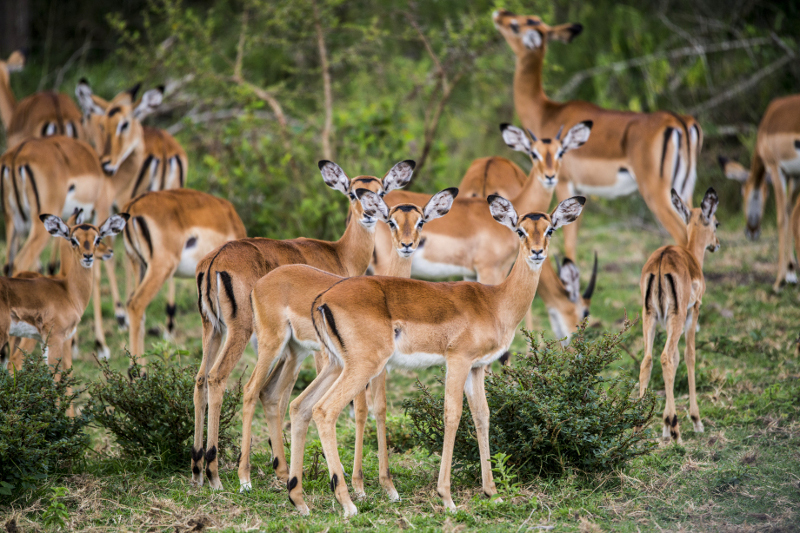 If you are interested in a more exciting safari then don’t miss to catch a glimpse at variety of playful antelope families while on your game drive. In Africa, they come in large numbers and in East Africa alone is comprised of over 20 to 30 different species of these spectacular mammal species and they thrive mostly in most of the savanna grassland. Over 29 species of these live in Uganda’s national parks and reserves. They include the greater Kudus, elands, Jackson’s hartebeest, semi aquatic sitatunga, Grant’s gazelle, Uganda Kob, Topis, Oribis and many more. These amazing mammal species largely thrive in Queen Elizabeth National Park, Kidepo Valley National Park, Semuliki Valley National Park, Murchison Falls National Park, Lake Mburo National Park and others. They also exist in countries like South Africa, Rwanda, Kenya, Tanzania, Malawi, Zimbabwe and others. Antelopes are largely herbivores, meaning they depend on grass and they graze just like cattle and they love very succulent leaves. They mate any time provided they are in maturity stage and generally, their gestation period ranges from 7 to 9 months. They are easily sighted in groups of over 500 individuals. They interact using various gestures and vocalization mostly when they are in danger times. Lions, cheetahs, hyenas, wild dogs and others are some of the predators. The Jackson’s hartebeests are highly endemic to Uganda as well as the semi aquatic sitatunga antelopes which feature splayed hooves that enable them to thrive in papyrus areas and they are mostly found in Kalangala Island. Some of these mammal species are also found in forests, woodlands, bushes and they are ruminants. They are fast wild animals with long strides they make with their long, slender and yet powerful legs. However, they use senses as a way for them to avoid predators and they can detect danger even at night. Besides, they use these senses to interact with each other whereas most of them depend on their large population where adults encircle their young ones as a way to guard them against predators and others trust their legs. Their lifespan in the wild isn’t known a fact that when they grow, the less speed they become to escape from enemies and in captivity, they can reach 20 years. They also come in a pelage with thick coat of short fur, different shades of brown and white or pale under bodies. Whereas others posses patches like topis which have purple patches, eland have small patches in the knees and there are two different types of elands-the giant and common eland. Giant elands are the biggest followed by the common ones. Uganda Kobs on other hand are the commonly sighted antelope family and the Kudus are mostly found in woodland. Other antelope species include the sable and they are a few largest in African continent and Nyala mainly thrive in the thick bush mostly along the riverine areas. In order for you to see antelopes in Uganda, you can embark on a game drive or nature walk in the popular national parks. Therefore, antelopes are among a few most magnificent wildlife species that are worth catching a glimpse while you are on a game safari in Uganda. They are mainly spotted in the vast savanna grassland protected areas. Where to See Lions in Uganda? Murchison Falls National Park the only national park which lies in northwestern Uganda and it features not just as the largest but also the most popular safari destination in the country. It comprises of stunning savanna grasslands with beautiful Borassus palm trees and they favor wildlife safaris. You can catch a glimpse at lions at this park while on game safari in Murchison Falls National Park especially in the northern part which is famous for diverse wildlife species. You can embark on early morning game drive or evening game drive. Interestingly, you can incorporate lion tracking with Murchison falls exploration or visit Ziwa sanctuary where you will track rhinos to make a complete list of the big five game. Kidepo Valley National Park lies in the northeastern side of Uganda and it is one of the few protected areas that are ideal for game drives. This park is splendid expanding to border between Uganda and South Sudan and it is one of the rugged areas with spectacular landscapes, wetlands and savanna plains. While on a game drive, you will catch a glimpse at these amazing creatures as they relax on rocks as they sun bath or on the ground under the tree shades in the middle of savanna grass. Kidepo Valley National Park was recently featured as one of the untouched natural wonders and in 2015; it was ranked the third best safari destination in Africa by CNN. Queen Elizabeth National Park, this is largely famous for its unique tree climbing lions at Ishasha area. They are usually sighted on fig trees and you catch a glimpse at them while on game drive through the designated lion tracking trails. Besides, there are lions at Kasenyi sector, northern side of Queen Elizabeth National Park and they are not the tree climbing ones. Along this track, you will spot most of them as they roam during your game drive. Game drives are conducted in the morning, afternoon and at night. You can pay a visit to Lake Mburo National Park or Semuliki Wildlife Reserve and you will have a chance to sight some lions. 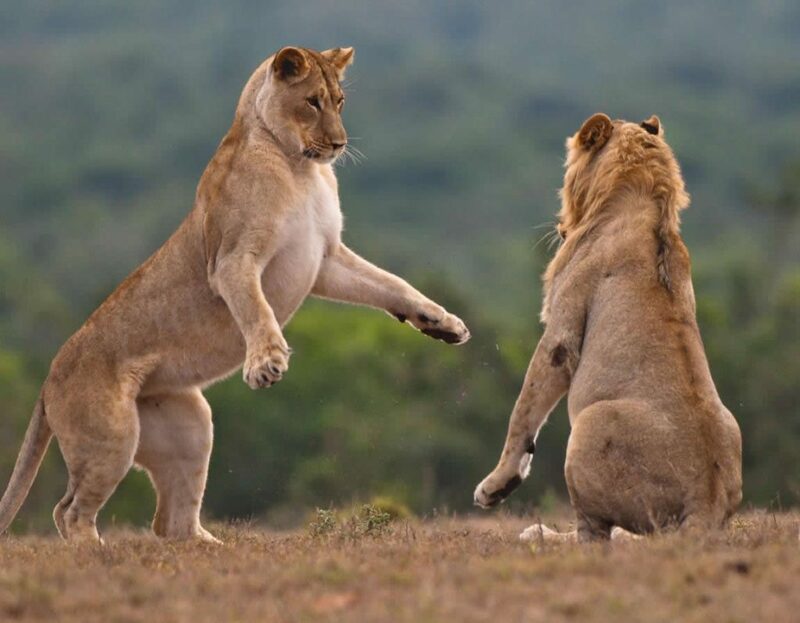 In conclusion therefore, lions have become the most sought after species by most visitors on African safari and in Uganda in particular, you can catch a glimpse at them while on game drive. However, they are among the most threatened species in the wild and this means that there is need to ensure that they are well protected.